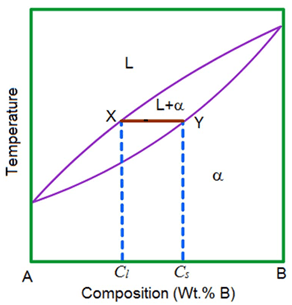 This set of Materials Science Mcqs focuses on “Binary Phase Diagrams”. 1. How many components are present in binary phase system? Explanation: In binary phase system there will be only two components. Explanation: The liquidus line is the line above which the alloy is liquid. At the temperature just below this line crystal of solid solution start forming. Explanation: Here, the two metals are soluble in all states. 4. What is XY line? Explanation: To find the composition of the individual phases in the two phase region, a line (XY) which is horizontal, called tie line, is drawn and its intercepts on the liquidus and solidus lines. 5. What is α region? Explanation: The solidus line is a line below which solidification completes. Hence, the only αsolid solution exists at any temperature below the solidus line. 6. What is used for determination of Phase amounts? Explanation: The above mentioned methods help in finding percentage fractions of phases. 7. A 53% Ni Cu-Ni alloy is cooled from the liquid state to 1300°C. Calculate the % of liquid and solid at 1300°C. Explanation: The tie line at 1300ﹾC intersects solidus at 58% Ni and liquidus at 45% Ni. %Solid = 100* (53 – 45)/(58 – 45) = 62% (100 – %Liquid). Explanation: For two phase system lever rule helps i.e. the tie line must be utilized in conjunction with a procedure that is often called the lever rule. 9. What is the equation for liquid mass fraction? 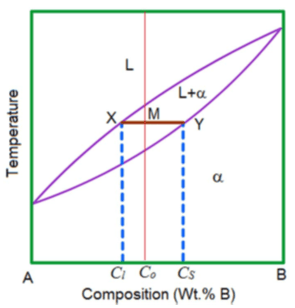 Explanation: Cα is composition of solid, CL is composition of liquid, C0 is composition of alloy. 10. What is the region between liquidus and solidus lines? Explanation: The intermediate region between liquidus and solidus lines is the two-phase region where liquid and solid coexists. 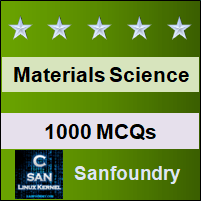 To practice MCQs on all areas of Materials Science, here is complete set of 1000+ Multiple Choice Questions and Answers.